A friend recently mentioned she had developed a new hip pain which was a worse with walking and was particularly annoying as it was waking her up at night (particularly if she was lying on her right side). Timing wise it started after a strenuous bicycle tour (fairly hilly). And she admitted that in retrospect her training was a little light. This is a nice summary article - if you ignore the mis-titling. 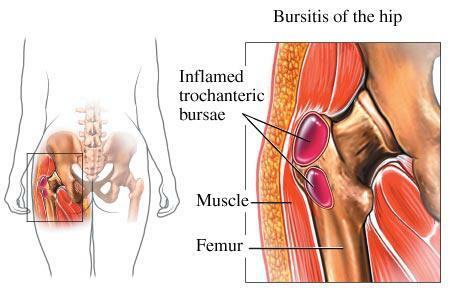 Greater trochanteric pain syndrome is also often misnamed trochanteric bursitis. However it is more than an inflammation of a specific fluid filled sac (bursa) in the hip area. Rather it reflects inflammation or injury to ANY of the tissues that lie over the bony prominence (the greater trochanter) at the top of the thigh bone (femur). Tissues that lie over the greater trochanter include muscles, tendons, strong fibrous tissue (fascia), in addition to bursae. It is more common after strenuous walking or running, but can occur with any overuse of the hip including cycling and swimming. And interestingly, it is more common in women. There are multiple approaches to treatment which reflect both the fact that this is a constellation of injury syndromes (not just a single muscle group) as well as the fact that there is no single best treatment for any of them. Anti inflammatories and limiting repeated injury while waiting for the normal healing process to take place are key. Deep tissue massage or a roller self applied to the lateral thigh and hip area to stretch out the muscles can be helpful as well. But the moral of this story is that the possibility of this injury could have been minimized with adequate training. So when you are planning your own trip, adventure, or century ride, it is worth putting in the training miles.